* This is my article in BusinessWorld on July 05, 2018. When developing economies attract multinational companies, they reap benefits. These developing economies get to have more commodities and services that otherwise would remain untapped for a long time. And, as a result, they also earn more revenues, taxes, and royalties even if these economies spent very little. Moreover, technology transfer from multinationals to developing economies is enabled as local professionals are hired to operate, maintain, and upgrade facilities. In the case of Malampaya gas to power project in offshore Palawan, the Philippine government has attained these and other advantages: (1) more electricity production from domestic natural gas, (2) more revenues via Malampaya royalties, 60% of gross production amounting to more than P400 billion over the last 16 years (see table). The Department of Energy’s (DoE) actual count of royalties from 2002 to 2017 is P424.7 billion. My computation above of P459.6 billion is only an estimate from a simple multiplication of $ million by the average exchange rate. The third benefit is that some of Malampaya gas is used to power compressed natural gas (CNG) buses that ply the Manila-Southern Luzon routes. As a result, less pollution is produced. The fourth benefit from the project is that it employs skilled Filipino professionals and engineers. Onshore Filipino staff also have the knowledge to build smaller platforms for offshore gas rigs. “Shell focused on tax fight, not Malampaya extension” (BusinessWorld, Dec. 8, 2017). “CoA: Malampaya must reimburse government P146 billion” (Philippine Star, May 17, 2018). Under Service Contract 38 with the Department of Energy, sharing of revenues is 60-40 for the Philippine government and the Malampaya consortium, respectively. The Philippine government spent almost nothing in the high-risk and very costly exploration and drilling for gas in deep waters far out from Palawan mainland. The government just collects 60% of total revenues because it is the government. 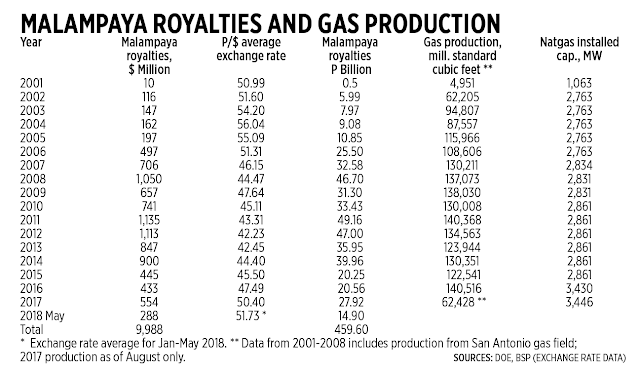 The Malampaya consortium spent huge amounts of money and technology, risked their people in the exploration, drilling, development, and laying down heavy pipelines in seabed hundreds of kilometers to Batangas power plants. And they get only 40% of the revenues. The consortium is composed of three companies with their respective equity participation in parenthesis: Shell Philippines Exploration B.V. (SPEX, 45%), Chevron Malampaya LLC (45%), and Philippine National Oil Co.-Exploration Corp. (PNOC-EC, 10%). The Commission on Audit (CoA) however, has ruled several years ago that aside from surrendering upfront 60% of gross revenues to the government, the consortium must pay income taxes to the BIR/DOF from their 40% share. That kind of thinking is scandalous for the following reasons. One, the law where SC 38 was based, Presidential Decree (PD) 87, “The Oil Exploration and Development Act of 1972,” gives the contractor, the Malampaya consortium, the privilege of bundling the income tax within the 60% share of government. Two, under PD 87, the government assumes zero investment cost and risk. So if the consortium did not discover huge amounts of natural gas from Malampaya, the government was not required reimburse them for expenses. Three, it does not recognize that aside from the huge money the Philippine government receives yearly from the consortium, electricity supply is significantly bolstered especially in the Luzon grid. Coal contributes 50% and natural gas contributes another 22% of total electricity production in the Philippines in 2017. These energy sources are stable 24/7 and are not intermittent, unstable, and unreliable such as solar and wind power. Four, the move by CoA discourages present and future investments in high risk, capital-and technology-intensive sectors that some government agencies can change rules somewhere and demand huge money midstream. It is good that the DoE, DoF and Office of Solicitor General (OSG) in previous administrations and even in current administration did not think this way. But the CoA remains persistent and has ordered the consortium to pay P146.8 billion or nearly $3 billion of “unpaid income taxes” from 2002 to 2017. CoA should stop these moves and consider the many other advantages of the Malampaya gas to the Philippine economy. 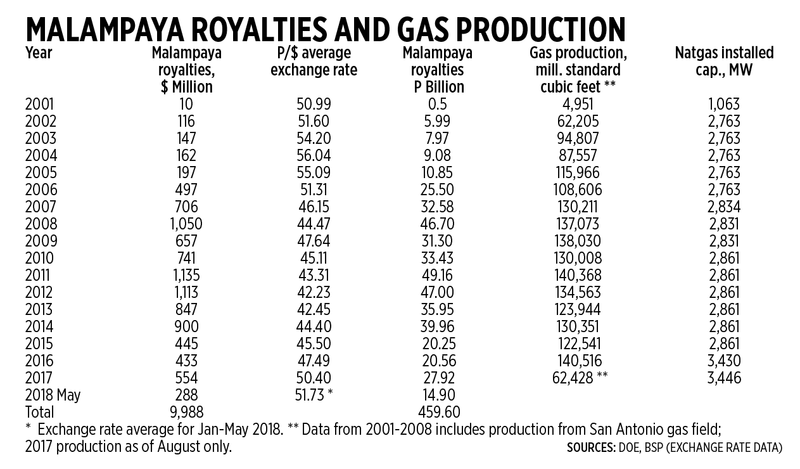 There should be more big private investments in the country like the Malampaya gas development, less politics, and intrusive government bureaucracies that discourage investments.